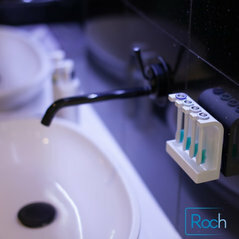 Annoyed with having to drop toothbrush heads into a small bowl, only to have them co-mingle in their own gunk, I set out to design something that was effective, stylish and easy to use. The result is the Head Stand after numerous failed designs. 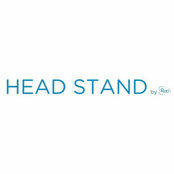 The Head Stand is simple yet functional, its clean simple lines make it easy to clean, while it's sloping front provides just enough curiosity for the eye. Made from solid polyresin it has a nice weight to it, making it stable so it won't easily topple over. At just 40mm deep it won't take up much room on your bathroom counter.